Let’s take a quick look at the reasons why hardly any sector can get by without integrating technical textiles into their products. Officially, technical textiles are not counted in the list of cutting-edge technologies according to Eurostat statistics, but they are most definitely essential in terms of many innovations in leading technologies such as car manufacturing, medical technology, aerospace technology and environmental technology. Here, they are important for solutions which would not work as well without them, as well as those which otherwise would not even exist. A straightforward example of technical textiles being used in the specialist area of space travel are spacesuits for astronauts. However, let’s take a closer look at some more complex examples, or in other words, innovations which are at the forefront of this technology. An area of application which falls into this category and demonstrates its great potential is “smart textiles.” This term refers to high-tech textiles whose fabrics and meshes contain conductive textile materials, components and sensors, or have these type of elements attached to them. Smart textiles were a hot topic at the last Techtextil, but developments in this sector have really been pushed to the forefront this year. What’s important here is that applications for these type of materials are becoming increasingly clear, and that we are recognising that these products could definitely reach large markets. The further development of technology into marketable products in particular is where the visitors to this year’s Techtextil will most likely get the chance to see numerous innovations from research and industry, especially, but not limited to, functional clothing and medical technology. Let’s review a few of the latest innovations in this sector. The Swiss company Schoeller Textil is working on a flexible, easy to cut-to-size, heatable, e-soft-shell material. This new laminate’s structure resembles that of a conventional soft-shell fabric with corkshell™ technology and can be manufactured as piece goods. The heatable backing fabric is produced by the Eschler company, which is part of the Schöller group. Specially incorporated conductive yarns enable an even distribution of heat and specific heating surfaces are functional under normal stress conditions. As well as this, the material can be dyed and is washable. In collaboration with the company Osmotex, Schoeller has also researched an electroosmotic membrane called HYDRO_BOT which can be used in outerwear. Eschler were also able to develop a textile surface made from highly conductive yarns which as a sensor for electrical impedance tomography makes lung monitoring in real time possible. This has allowed medical professionals and carers to see exactly what is happening within the chest of an artificially ventilated patient for the first time ever. This way, doctors can adapt therapeutic measures as required. Compared to the new field of applications for “smart textiles,” filters have been an established application for decades. However, anyone who expects fewer innovations for that very reason is sorely mistaken, because innovative products in this sector are being created all the time using new fibres, non-woven materials, fabrics or new production processes. They are also being produced through innovative sourcing ideas. The manufacturers of viscose special fibres at Kelheim Fibres, for example, procured a new application idea for filters after holding an ideas competition for this purpose, and are sure to impress at Techtextil by telling us all about the project. Dr. Jürgen Pettrak, who is involved in drainage and water purification in Straubing, Bavaria, won with the idea to use filters made from functionalised viscose fibres as part of a fourth clarification stage, which is designed to filter out the increasing amount of endocrine substances now found in water. These endocrine substances end up in our water as they are being used more and more in medication and livestock farming, which in turn could have dire consequences for our DNA. Advancements can also be expected in the area of non-woven filters. For example, Freudenberg Filtration Technologies has just received the FILTREX Innovation Award 2017 for the micronAir blue motor vehicle cabin air filter. 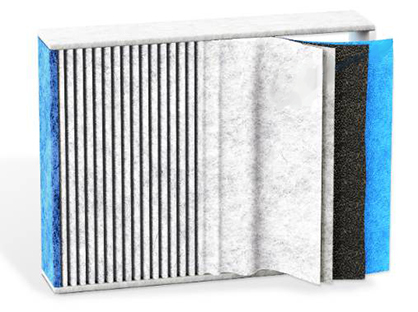 While conventional motor vehicle particles and combination filters merely prevent soot, dust and unpleasant odours from entering through the air conditioning, micronAir reliably keeps out fine dust almost 100%, blocks virtually 100% of all allergens ≥2 µm in the airflow, and hinders mould microspores on a long term basis. When it comes to filter fabrics, you can look forward to the improvements and new solutions that can now be achieved by weaving on the new Type P2 rapier weaving machines by Lindauer DORNIER. The P2 was presented for the first time at ITMA 2015 and manufactured in a width of 320 cm with two heavy duty warp beams and a high-density filter fabric, which, up until now, could only be manufactured in this width using very expensive specialized machines. This extremely high density is facilitated by a reed beat-up force of 5 tonnes, a slip-free take-up motion and total weft uniformity. Fabrics produced in this way always have the same mesh number per cm2 and are therefore uniform throughout. Density and uniformity are fundamental requirements for this type of filter fabric. “Markets and Markets” also believes that the market for this industry is on a compelling growth trajectory with an annual growth rate of 6.1% from 2016 to 2021. Therefore, the total market which was worth $22.91 billion in 2016 could increase to $30.78 billion by 2021. These are just a few examples from the “smart textile” and filter sector and do not represent the huge number of innovations from the various fields of application for technical textiles and non-woven materials which will be presented at Techtextil 2017 in Frankfurt this May. More than ever, a trip to this trade fair is simply a must for anyone who wants to make textile products profitable for their company and their sector. And with the “Techtextil Symposium,” an interactive special area for “Textile Processing Technologies in Space Travel,” the second ever “Innovative Apparel Show” after its great success two years ago, the “Techtextil Innovation Award” and the student competition “Textile Structures for New Construction 2017,” visitors are expecting a wide variety of other highlights. Techtextil is sure to continue on its path as an innovative trade fair well into the future.